Copy right date is 1977. 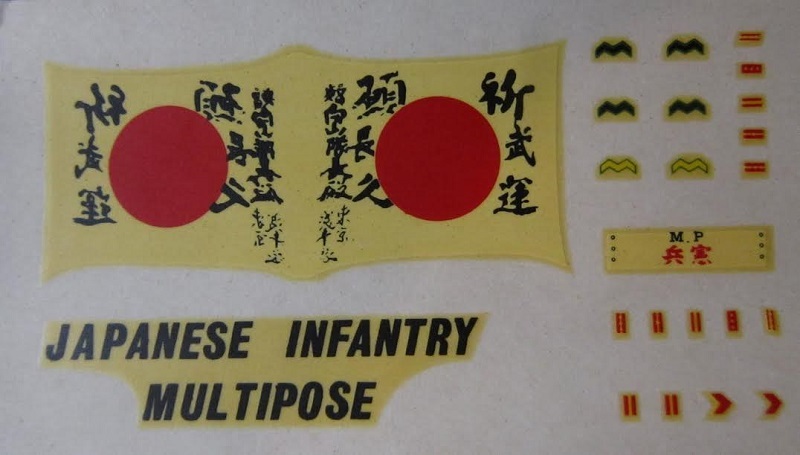 ​List of Japanese Infantry divisions of the Imperial Japanese Army. During World War II, the IJA organized three Guards Divisions and over 220 infantry divisions of various types(A/Reinforced,B/Standard,C/Counter-insurgency). On 7 December the IJA had two divisions serving in Japan/Korea and 50 serving abroad, most in China. During the war another 117 were raised for foreign service and 56 were raised for national defense. These totaled 223 including the Imperial Guard. Additionally one parachute and four armored divisions were formed. Of this total no more than 35, that is one fifth of the IJA infantry division total, fought in the Pacific theater. Airfix is an old prolific model company. They manufacture all manner of model subjects in the popular scales. This kit came in a shrink-wrapped end opening type box. I am no fan of this type of box, because invariably parts or the decal sheet find their way past one of the end flaps to become lost forever. Give me a tray and lid type box any day of the week. 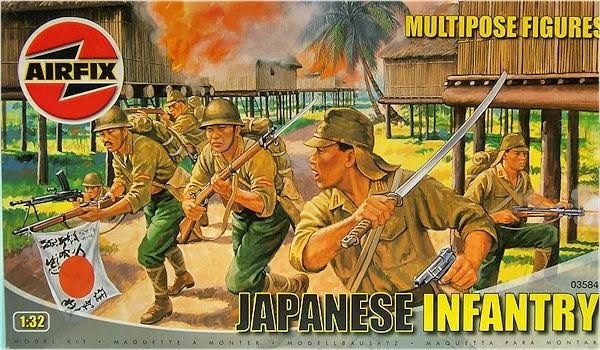 The box art shows 6 Japanese infantrymen advancing through a bamboo forest. There are 5 soldiers and one officer shown. One soldier is prone and firing a heavy machine gun. Three of the soldiers have rifles. One rifle has a bayonet mounted on it and another rifle has a patriotic flag strung from its shoulder strap. A kneeling soldier is firing a sub-machine gun. The soldiers all have back packs on them. The officer in the foreground is brandishing a sword in his right hand and a pistol in the right. 3 soldiers wear steel helmets. The other 2 soldiers and the officer wear soft peaked field caps with neck ribbons. All the figures have their pants tucked into puttees. One side panel gives Airfix's location as being in London, England. 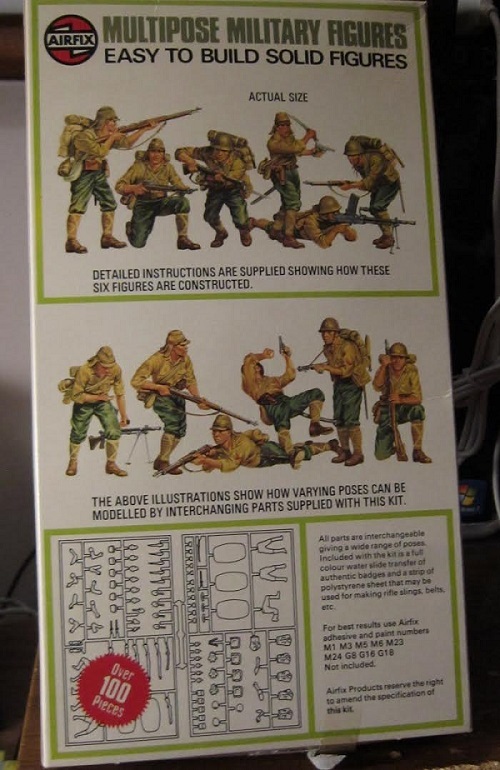 The back of the box has 2 color illustrations of the 6 figures in alternate poses that are possible with the kit parts chosen. Below these is a parts tree illustration. This tree holds 2 chalk-white trees of parts, a thin sheet of white plastic, the decal sheet and instructions all in a sealed cello bag. ​The strip of thin white plastic is to use to cut and make rifle slings out of. ​The decal sheet has the patriotic flag and uniform insignia on it. These are neat well-molded Japanese figures. While not 1/35th scale they are not dwarfed when posed next to figures that scale. Besides Japanese are smaller people that their enemies. 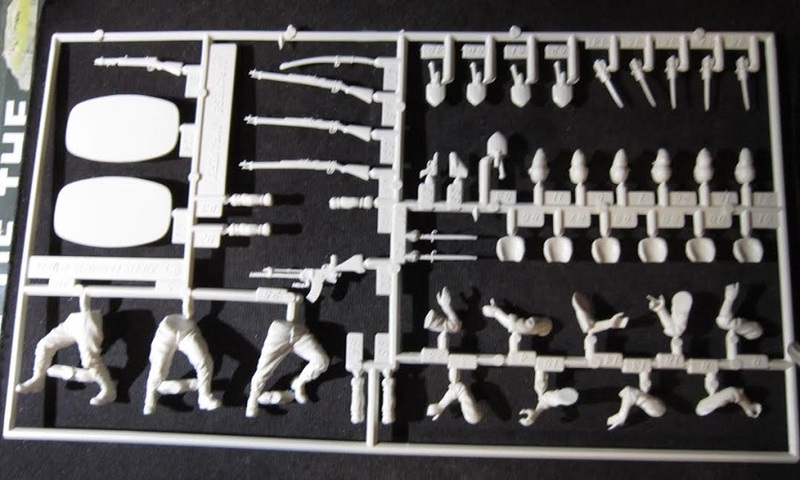 I used this to advantage by making a banzai charge diorama years ago with 2 of these kits and a kit of British soldiers that are facing them. This diorama won an award at a IPMS contest 40 years ago. ​I bought my kit at my local hobby shop.